The 2404 Atmosphere Controllers provide accurate display and control of carbon level in carburizing furnaces and ceramic glazing kilns. There are three different controllers that connect to a variety of common zirconia probes, including the Series AP from Eurotherm, which measure the % oxygen in a furnace. The carbon level is calculated from two inputs, the % O2 and temperature measured by the probe. An optional third input can accept a signal from a CO or H2 analyzer, thus providing a more precise carbon or dewpoint measurement. In addition to carbon levels, the controller can be configured to measure % O2, log O2, dewpoint (°C or °F) and probe millivolts. A probe clean output forces compressed air through the probe at regular intervals to burn off soot. A sooting alarm will warn if carbon deposits build up to give false readings. Health of the probe is measured by monitoring the time it takes the probe mV reading to recover from self-clean. Probe clean and CO/H2 compensation are enabled by digital inputs. A range of plug-in modules provide control, alarm and retransmission options. Optional Modbus®, ASCII, or Profibus® communications are available. 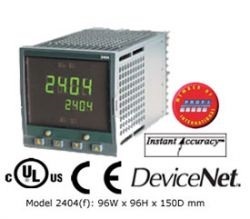 ESO209 – This low cost version offers PID and two module slots plus Modbus® or ASCII communications. ES0288 – This version is identical to ES0209, but with Profibus®-DPcommunications.